Unique nature of Iceland remains its signature landmark. Volcanic landscapes, mountain rivers and lakes, hot springs and waterfalls make the country look truly unusual and unforgettable. However, Iceland is rich not only in wonderful nature as there are as well many landmarks there. 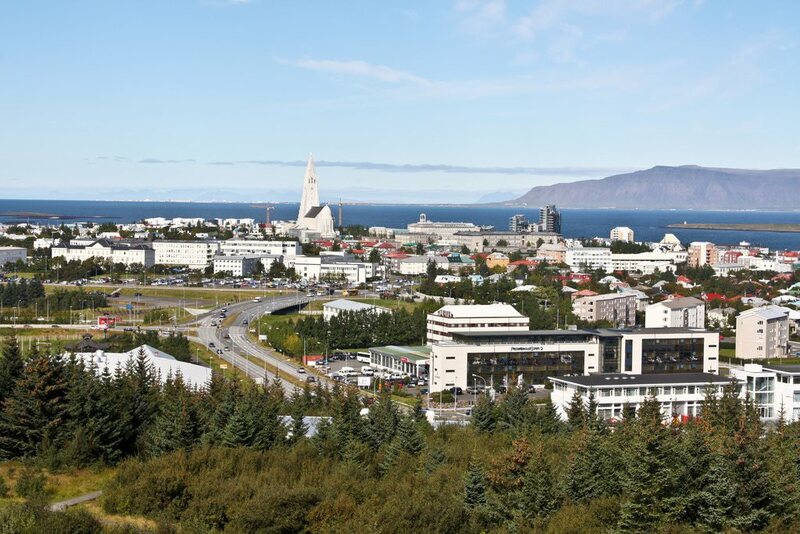 The best way to start your acquaintance with the historic heritage of the country is to visit its capital, the city of Reykjavik. The Parliament House and the building of the Government are among the most famous architectural landmarks of the city. Both the buildings were constructed in the 18th century. There are many old buildings in Reykjavik, but the majority were transformed into shops and restaurants, so a simple walk on the streets of the city will let you see many interesting buildings. Continue your excursion program by visiting the National Gallery of Iceland and National Museum that exhibit collections of mostly historic items. Don’t forget to visit Hallgrímskirkja Church. This is one of a few churches in Europe made in modern style. Fans of nature will be pleased to visit the local botanic garden. Travellers are also recommended to visit the geothermal lake “Blue Lagoon”, which is located on Reykjanes Peninsula. The temperature in the lake never falls below +16C, and because of high content of salt and minerals the water in the lake has a specific blue colour. When it comes to describing nature attractions of Iceland, we simply cannot fail to mention wonderful waterfalls. The most beautiful waterfalls in Iceland are Gullfoss, Godafoss, Skougarfoss, Dettifoss, and Haifoss. A visit to the main volcanoes of the country – Hekla, Laki and Helgafell – will be no less interesting. Many sleeping volcanoes can be found on Surtsey Island, which has become very popular with local fans of fishing. Grimsey Island is famous for its wild nature and rich fauna. The island can be reached by ferry. The formation of the first country at the site of present Iceland is primarily associated with King Harald I. When Norway was governed by the King, many families were not satisfied with his regime. They had to leave their houses and find new places for establishing settlements. Gradually, the settlers formed their state system first mentioned in 930. However, the new country didn’t manage to gain the complete independence from Norway. In 1262, Iceland signed a contract, according to which it had to recognize the supreme authority of Norwegian kings. Iceland became completely independent from Norway and Denmark in 1944, after hundred years of struggle. Iceland is considered as an ideal country for active recreation due to its incomparable natural resources. During the warm season, one of the main travelers’ entertainments is hiking. Travelers have an opportunity to walk along unique volcanic areas, admire desert lunar landscapes and see craters of extinct volcanoes. Iceland cultural sights. What to see? In Iceland, there are beautiful forests, among which dense thickets swift rivers and waterfalls are hidden. Another interesting nature attractions are geysers. In summer, travelers can take an interesting boat trip and admire whales and dolphins. Anglers won’t be bored too, as they can take a trip to the most interesting places for the fishery. 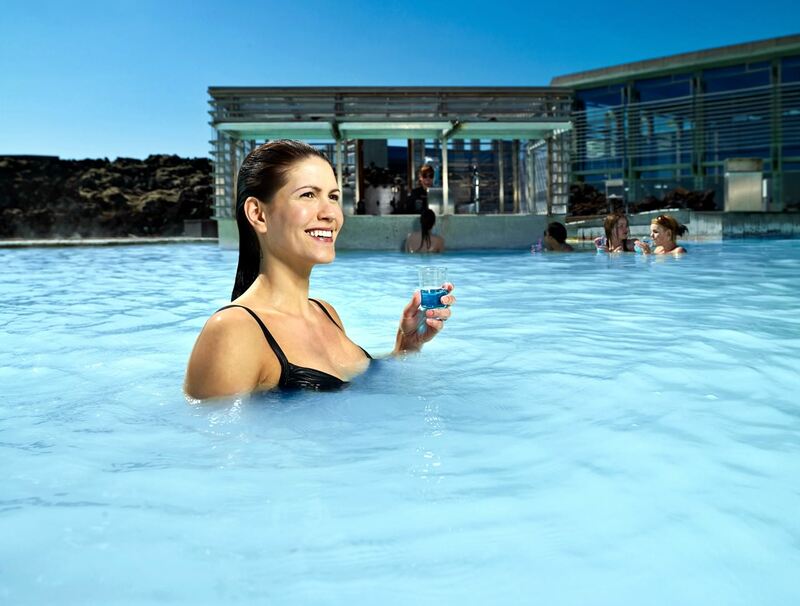 In recent years, spa tours available in any season became very popular in Iceland. There are also upscale thermal centers that formed near the springs of healing thermal waters. The guests of such wellness resorts are offered to swim in luxurious indoor pools and treat themselves to different spa procedures. The country is visited by fans of extreme sports too. Rocks make Iceland quite attractive for climbers. Some natural areas have long been favored by hang-gliders. 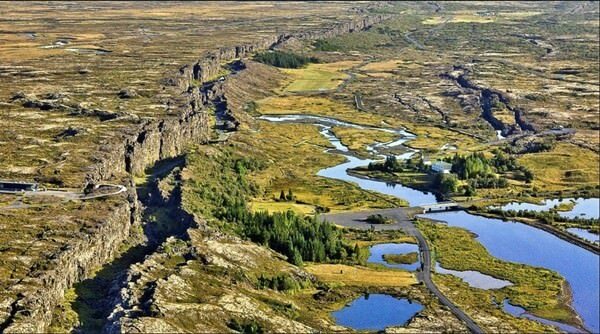 The Thingvellir National Park is the richest in nature attractions. You can see here magnificent lakes and geysers. There are also a lot of hiking routes starting from the territory of the park. This article about iconic landmarks and sights of Iceland is protected by the copyright law. You can re-use the content, but only under the condition of placement of an active link to www.orangesmile.com. Last years the researchers keep a close eye to the Iceland volcanoes. Earlier their power and dangerousness were underestimated. On the territory of the island, you can see several faults of the earth that has appeared after the movements of Eurasia and North American tectonic plates. The plates go from each other year by year for 7 mm. At the first glance, it seems not so crucial. However, for the last 10 000 years, the fault became bigger for 70 meters. If we put together these measures with the Earth age, these changes are drastically big. In Ireland there is an outstanding bar for people who want to watch the polar light. 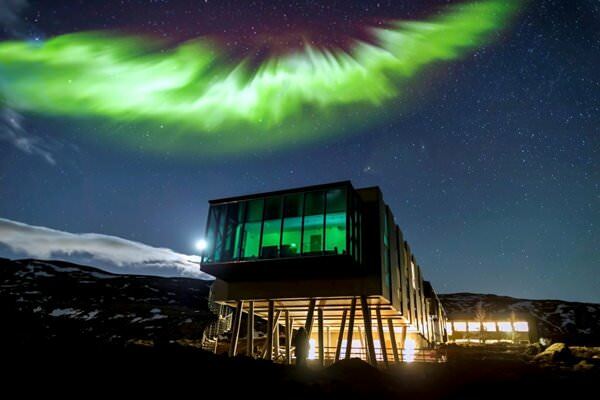 This bar is located in a picturesque place, near Reykjavik, among the endless lava fields in a futuristic building. In it you can also find a modern ION Hotel, that is very popular among people who want to get away from the noisy cities. Not everyone knows about luxurious balneological health resort – Lagoon Bar. Life-giving thermae, that is located there, do not freeze even in winter. In that season they are like beautiful natural pools among the snow. Several years ago, a comfortable resort has been formed there. And one of the most unusual bars was opened here. According to enjoying the hydrotherapeutic procedures in a huge pool, you can try original cocktails and some chasers.